This issue addresses a variety of issues regarding the measurement and evaluation of fundraising costs and activities. Topics examined include watchdog groups and the effect of their ratings on public perceptions; emerging data on workplace solicitation of federal employees; and summary results from a national study of nonprofit fundraising and administrative costs. Contributors present innovative concepts such as a vision for using the price of outcomes to encourage funder support of particular social service delivery programs as well as cautionary satire against using simple ratios to gauge fundraising efficiency that can mask the "ill–intentioned fundraising abusers" who place profit above mission. The culminating chapter presents the findings of a trio of nonprofit accounting professors who analyze professional fundraising firms, demonstrating that solicitation firms often keep most of the contributions in most campaigns. 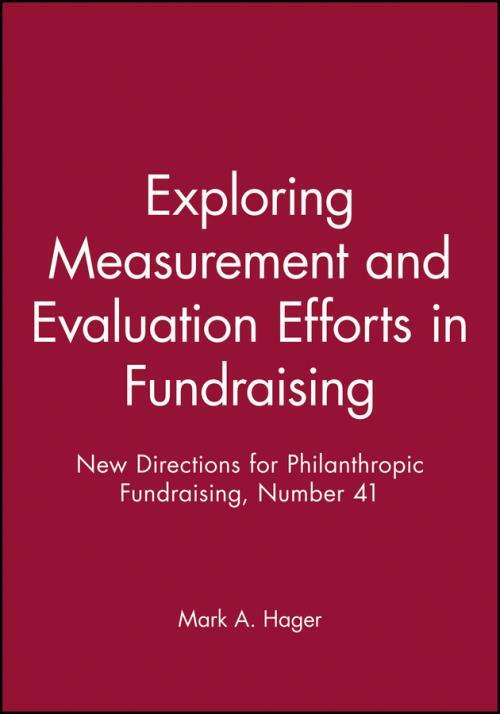 Taken together, the chapters reflect three major themes in evaluation and measurement of fundraising today. First, research on fundraising has the definite benefit of teaching students of the field what the field looks like. Secondly, the issue s contributors explore the quality of information we have when we seek to measure and evaluate charities and their fundraising activities. Finally, this issue sheds a much–needed light on the kinds of decisions people make from evaluation of fundraising and argues that the result is that the bottom line and financial efficiency have become the measures by which we assess charities in the United States. This is the 100th issue of the Jossey–Bass quarterly journal New Directions for Philanthropic Fundraising.